For the monastic order, see Sylvestrines. The Pontifical Equestrian Order of St. Gregory the Great (Latin: Ordo Sancti Gregorii Magni; Italian: Ordine di San Gregorio Magno) was established on 1 September 1831, by Pope Gregory XVI, seven months after his election to that seat by the College of Cardinals. 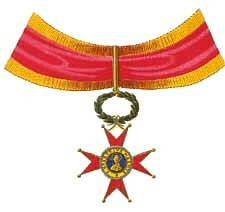 An honorary Order of Knighthood of the Holy See, but not necessarily of the Roman Catholic Church. Bestowed by authority of the Pope as the monarch of the Holy See and as the temporal sovereign of the Vatican City State. The motto of the Order of St. Gregory the Great is Pro Deo et Principe ("For God and Ruler"). An eight-pointed cross, the insignia of the Order, bears a representation of St. Gregory on the obverse and on the reverse the motto Pro Deo et Principe ("For God and Ruler"). The cross is suspended from a red and gold ribbon. 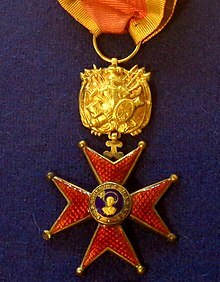 In ecclesiastical heraldry, laymen awarded the high rank of Grand Cross can display a red and gold ribbon surrounding the shield in their personal coats of arms, but the recipients of the lower ranks place an appropriate ribbon below the shield. The difference between the civilian and military insignia is that the former group wears the cross hanging from a green crown of laurel, whereas the latter group wears the cross hanging from a trophy of arms. A green uniform was later prescribed by Pope Pius IX. The uniform contains a black beaver-felt hat decorated with black silk ribbons, silver metallic twisted rope, buttons and black ostrich feathers. The jacket, made of green wool, is trimmed with silver metallic thread, and has a tail, nine yellow metal buttons in the front and three buttons on the cuffs and is lined with black satin. Finally, the costume contains suspenders, several yellow and red rosettes, white leather gloves, and a short sword with a handle made of mother of pearl with a medallion of the order at the end. 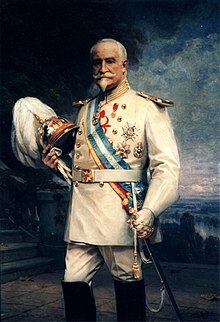 Juan Mariano de Goyeneche y Gamio, 3rd Count of Guaqui and Grandee of Spain, wearing the Grand Cross and sash of the Order of St. Gregory the Great. Sir George Bowyer, 6th Baronet, Knight Grand Cross. George Forbes, 7th Earl of Granard, Knight Grand Cross. Peter Paul McSwiney, 1875, Knight Grand Cross, Lord Mayor of Dublin (Ireland), Irish entrepreneur owner of the Palatial Mart. Alice von Hildebrand, 2013, Dame Grand Cross. Dina Kawar, previous ambassador of Jordan to France. Jimmy Savile OBE, 1990, English radio DJ and television presenter-broadcaster (at present subject to a request for annulment from the Archbishop of Westminster). Matt Busby, CBE, Sportsman; manager of Manchester United F.C. Viscount Gaston Eyskens, Prime Minister of Belgium. Paul Salamunovich, 1969, American choral conductor and expert on Gregorian chant. Dr. Clinton Brand, Member of Anglicanae traditiones (Anglican traditions) Interdicasterial Commission, whose task has been to identify Anglican liturgical and spiritual patrimony and to incorporate it into Catholic worship for the Personal Ordinariates. John A. Creighton, 1898, businessman and philanthropist in Omaha. ^ Begni, Ernesto; Grey, James C.; Kennedy, Thomas J. (1914). The Vatican: Its History, Its Treasures. Letters and Arts Publishing Company. p. 515. Retrieved 31 August 2016. ^ Dart, John (3 January 1998). "Pope Bestows Knighthood on 64 Prominent L.A. Catholics; Religion: Non-Catholics Bob Hope, Rupert Pope Honors Rupert Murdoch, Roy Disney, Bob Hope". LA Times. Retrieved 25 April 2018. ^ "The Pontifical Order of Saint Gregory the Great". Papalknights.org.uk. Association of Papal Orders in Great Britain of Pius IX, Saint Gregory and Saint Sylvester. Archived from the original on 26 December 2010. Retrieved 2 October 2010. ^ a b c Gorman, W. Gordon (1885). Converts to Rome : A list of about four thousand Protestants who have recently become Roman Catholics. London: W. Swan Sonnenschein and Co. pp. 1–3. ^ "Cardinal Confers Papal Awards on Three Outstanding Australians". Catholic Communications. Archdiocese of Sydney. 7 February 2013. Retrieved 2 February 2014. ^ "'Heart, soul' of NSW Labor dead at 87". Special Broadcasting Service. 9 August 2017. Retrieved 10 August 2017. ^ a b "Archbishop Paul Richard Gallagher's statement at the General Debate of the 73rd Session of the General Assembly". ^ ""The Pope's Maestro," Sir Gilbert Levine Conferred with Papal Honor". Archdiocese of Washington. 31 January 2016. Retrieved 6 February 2016. ^ "Alice von Hildebrand". Retrieved 19 February 2014. ^ a b c John Dart (3 January 1998). "Pope Honors Rupert Murdoch, Roy Disney, Bob Hope". LA Times (Archived Article). Retrieved 18 June 2014. ^ "Vatican Official Document" (PDF). ^ Fürstin Gloria von Thurn und Taxis erhält päpstlichen St.-Gregorius-Orden Archived 28 September 2011 at the Wayback Machine, Bistum Regensburg. ^ Tubb, Gerard (9 November 2011). "Fans Flock To Cathedral Service For Sir Jimmy". Sky News. Retrieved 10 November 2011. ^ "John Hume knighted by Pope Benedict". BBC News. Retrieved 7 June 2012. ^ "Vatican Commentarium Officiale" (PDF). ^ "Fundação Oscar Niemeyer". Retrieved 19 July 2017. ^ "Hemeroteca ABC". Hemeroteca.abc.es. Retrieved 18 June 2014. ^ Pentin, Edward (15 January 2018). "Vatican: Papal Honor for Pro-Abortion Politician Not a Sign of Support". National Catholic Register. Retrieved 15 January 2018. ^ "accessed 14 September 2007". Nndb.com. Retrieved 18 June 2014. ^ "Count John A. Creighton Dead: Nebraskan Who Founded Colleges Was Ennobled by the Pope," New York Times. 8 February 1907. Retrieved 1/22/08. ^ Schiavone, Michael J. (2009). Dictionary of Maltese Biographies Vol. 2 G–Z. Pietà: Pubblikazzjonijiet Indipendenza. p. 891. ISBN 9789993291329. ^ "Papal Honour for Mawby". The Contemporary Music Centre Ireland. 20 April 2006. Retrieved 21 January 2012. ^ "British Society for the Turin Shroud - Issue #47". shroud.com. Retrieved 27 October 2015. ^ Ryelandt, Joseph (the Knight’s grandson, not the Knight himself) Histoire de la famille Ryelandt et des familles alliées (Brussels, 2003; a private publication; a copy has been deposited in the National Library), p. 120. ^ Karaula 2009, p. 148. ^ "Grave of John Bernard Thielen". ^ "Ann Widdecombe awarded papal honour". Indcatholicnews.com. 31 January 2013. Retrieved 18 June 2014. Karaula, Željko (2009). "Pisma crnogorskog pjesnika, svećenika i diplomata Jovana Sunečića bosansko-đakovačkom i srijemskom biskupu Josipu Jurju Strossmayeru (1881. - 1887.)". Diacovensia (in Croatian). Đakovo: Katolički bogoslovni fakultet u Đakovu (12). ISSN 1849-014X.